Have you ever heard, “Successful sales people are born with a gift for sales.” ? This belief rests on the assumption that success in sales relies on some special talent granted at birth. However, this does not fit our experience. It may be true that some people are born with ‘talent’, meaning an abundance of charisma and ease with people. Charisma may help close some sales. However, we find that successful sales people, those who are top in their field year after year, work diligently to develop their sales skills regardless of their starting capability. At this point in training discussions, people often ask: “Talent or skill. What’s the difference?” To answer this question, let’s define some terms. Skill – Proficiency, facility, or dexterity that is acquired or developed through training or experience. The difference is pretty simple. Talents are natural abilities. Skills are acquired or developed abilities. Let me make one thing clear. Talent (charisma / personality) will help make sales. However, those depending upon talent tend to ‘shoot from the hip’ when making a sales presentation. This results in a very entertaining presentation. The sales professional may seem to be able to ‘sell ice to eskimos’. Unfortunately, the majority of prospects cannot follow this type of presentation. Most people want a logical progression of information backed up by solid data. So, although the client may like the sales professional personally, they may actually purchase a similar product from someone else. Notice that a skill is something learned or developed. Hence, with the assistance of a qualified trainer and measured practice, those who have the desire to apply themselves toward mastering the task will succeed. Giving my clients the time they need to reach a decision. Basically, I started with very few of the positives and nearly all of the negatives. The one thing I really had in my favor was persistence. I initially got results because I kept going in the face of rejection. My closing ratio was low, but I made lots of sales calls. 1. First, you must have leads: I remember hearing someone say, “Just keep throwing mud on the wall. Some of it will stick.” No! You just waste time and end up with a dirty wall. Unfortunately, driving all over town searching for someone to listen to your presentation is usually a waste of time and gas. Don’t equate being busy with productivity. It is more effective to prequalify the leads you pursue. Above all, develop a lead generation process which includes leveraging LinkedIn, quality referrals, and industry specific leads. 2. Next, you must turn your leads into appointments: “Let your fingers do the walking” and develop the skills to book appointments on the phone. In addition, discover how to navigate the gatekeeper and reach decision makers. I’ve created a proven system for booking appointments on the phone. Making only 10-20 outbound calls per day will keep your calendar full and your pockets ‘fuller’. 3. Reading prospects: Become a student of human behavior and improve your communication skills. Furthermore, discover how to connect with prospects and clients for closing more deals and developing long term, repeat business. Likewise, I’ve learned to not only care about my customers needs, but to show that I care. It may look natural, but trust me it is not. I had to really work on me to develop these skills. After I learned and began to apply the DISC Model of Human Behavior in the way that we teach today, my closing ratio skyrocketed. It’s like taking the Pici’s with you on your next sales call. 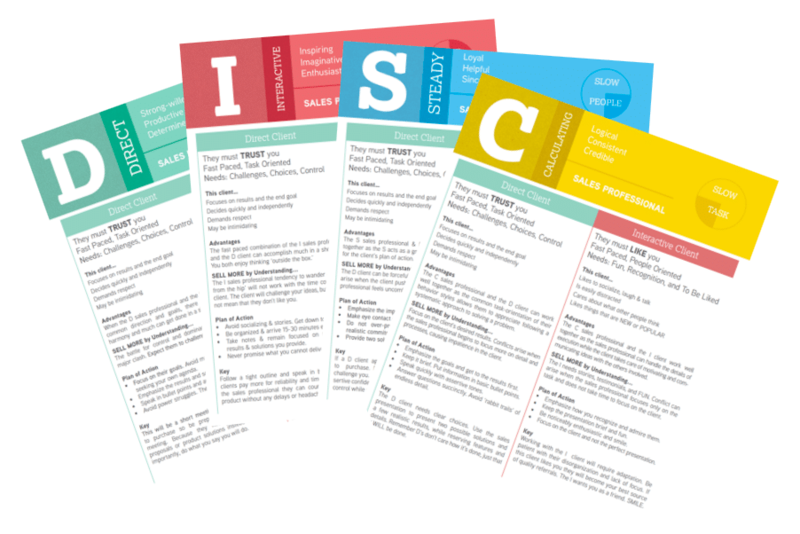 Our flip charts will remind you how to: Recognize and adapt to your client’s communication style. 4. Develop a simple, short, and logical sales presentation: I call this your ‘core story’. Your core story should be dominated by your client talking, not you. Most noteworthy, you can achieve this by asking relevant questions. Above all, design questions that will reveal the pain your client may be experiencing. Situations that will cause them to purchase a product/service from you. 5. Close the deal: Closing is the sales skill set that most sales professionals focus on. Yet, closing is the natural conclusion to a sales process that began with the first contact. Therefore, do not depend on one or two closing techniques. In addition, avoid being discouraged if you cannot close your prospect at the first meeting. Closing the deal may take several days/weeks/months or only a few minutes. Certainly, the study of human behavior will help you determine which time frame and approach will be best for each individual. 5. Finally, remember to follow up: The purpose of follow up is three fold. a) Make sure the client is satisfied with the product. Answer any questions regarding the use, installment, or difficulty with the product. b) Secure future sales including cross selling. c) Attain quality referrals. Certainly, this is the lifeblood of your business. By improving my effectiveness through skill development, I improved my results without working harder or longer. I still work hard and long to achieve success, but now my effectiveness has improved to the point that many people see me perform at an unconsciously competent level in the sales arena. Because I know the effort that went into developing my skills, I realize that what looks like natural talent to others is actually a highly polished set of skills. Lots of sales people eventually burn-out due to excessive rejection, long hours, or both. Most people don’t have the stomach for tolerating rejection that I have. And most people don’t want to develop the thick skin necessary to put up with it. As a result, many otherwise great sales people give up their dreams of success when they reach the burn-out stage. I want to give people the tools to overcome that challenge before they reach burn-out. Everyone can develop the skills. I’m willing to share what I’ve learned so that they don’t have to go through the same amount of rejection I faced before I learned these skills. I don’t have a monopoly on what it takes to be great as a sales professional. I’ve just learned to apply some really powerful, practical, and effective ideas to the sales process. Anyone with the desire to work on themselves and grow personally can learn what I’ve learned. It really doesn’t matter where people start, as long as they view sales as a profession and invest the effort necessary to learn and perfect the skills. Successful sales people become successful by applying a set of learnable skills. See what the Rapport Mastery Sales Boot Camp can do for you! 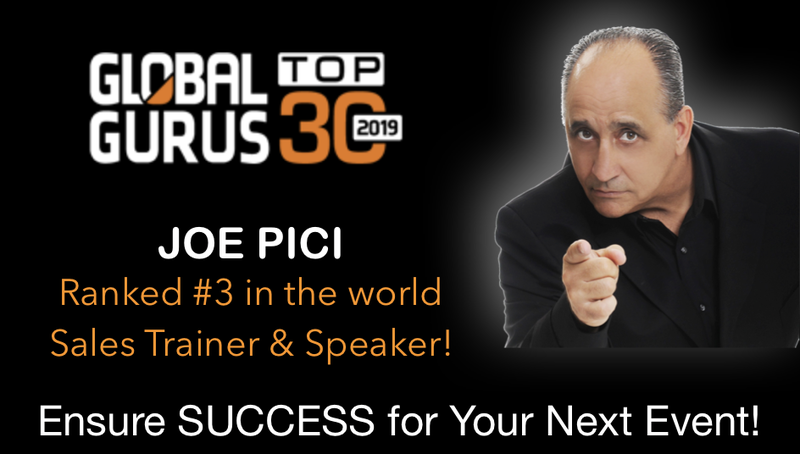 Joe Pici is ranked 3rd in the world for sales training and keynote speaking by Global Gurus.